Vampire Weekend alight at Radio City. 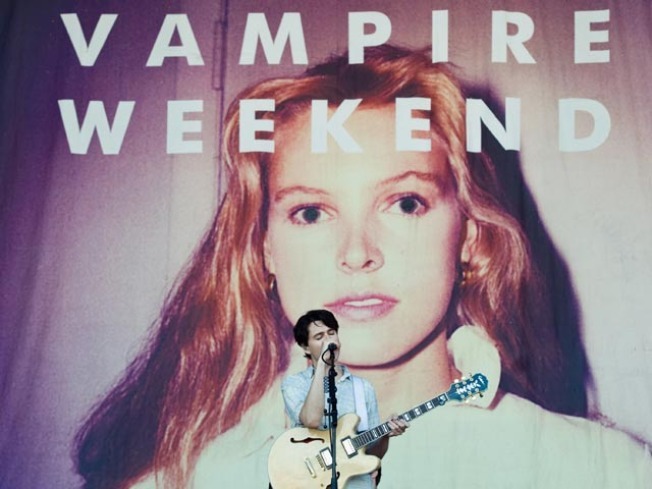 CONTRA BAND: From terrier-emblazoned sweaters to sub-Saharan rhythms, Vampire Weekend’s given fans plenty of signifiers to chew on since they splashed onto the scene in 2007. They’ve been whistle-stopping the globe over with their most recent release, Contra; tonight marks the second of three shows at Radio City Music Hall via Bowery Presents. 8PM. IL BORGO ANTICO: It’s that time of year again: As the air chills, get ready to devour sausage pep’ and cannoli while looking down at Little Italy from the Ferris Wheel and contemplating whether you should drop $12 on a “Fuhgeddaboudit” onesie for your nephew. The 84th Feast of San Gennaro kicks off today, running through 9/26. SECRET CHORD: The next best thing to attending a Leonard Cohen concert is catching tonight’s screening of Songs from the Road. It’s a dozen of the broody Canadian’s performances, collected on tour stops from Tel Aviv to the California desert, and it puts you unmistakably there in all of them. 92Y Tribeca, 7:30PM.